Once again we are seeing polar vortexes and this is very possibly due to the dilution of the Gulf Stream which could bring on an "Ice Age" to America and parts of Europe. Global warming is causing this by melting the ice caps and things could get much more severe not in decades but in the next few years. The first wave of below-freezing temps hits the Midwest, Rocky Mountains and Pacific Northwest this weekend, the Washington Post reports. Thermometers could read 30 to 50 degrees below average for this time of year. Even worse, Ryan Maue, a meteorologist with WeatherBell Analytics, predicted "-30°F to -40°F" wind chills. That's cold enough to just stay inside forever. The core of the cold will grip the North Central states on Tuesday, before reaching the Northeast, including the Interstate-95 corridor, on Thursday. Fargo, North Dakota; Minneapolis; Chicago; and Madison, Wisconsin, are a handful of the cities that will bear the brunt of the frigid conditions. High temperatures will be in the single digits to slightly below zero for multiple days from the Dakotas through Minnesota and Wisconsin. Highs during this past week’s cold outbreak were in the teens and lower 20s in these same areas. Highs in Chicago may not reach 10 degrees Fahrenheit by Thursday. “Temperatures this low are 20 to 30 degrees Fahrenheit below average,” Vido said. Low temperatures in the Midwest will plummet well below zero for most beginning as early as Monday night. It is strange that over the years in December we usually see a lot of news on the weather, the flu, and other disease outbreaks around the world. This weather would be really disturbing to many in years past. I lost someone in February 2014 in Chicago to the flu and freezing temps. We are still seeing signs of an approaching dilution of the Gulf Stream and a possible "Ice Age" in the U.S. and parts of Europe. The Siberian Express will ride again next week, as frigid air pushes across much of the U.S. with temperatures in some places dropping to as much as 50 degrees Fahrenheit below average for this time of year. The cold will come courtesy of two main weather features — a wobble in the upper level polar vortex that will pull cold air out of Siberia, Alaska and Canada. 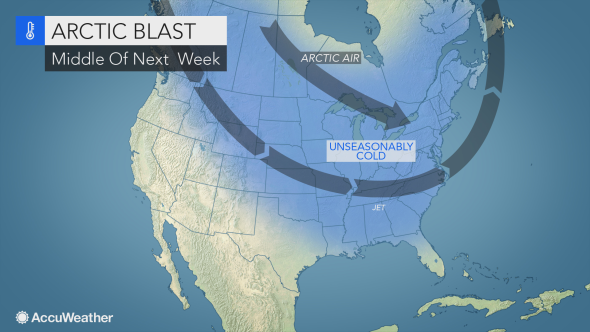 The much-maligned polar vortex is involved in this upcoming weather whiplash event, in which parts of the U.S. will dramatically cool after the country saw its warmest fall season on record. It is amazing how the media is so wrapped up in the U.S. election they are ignoring most of the major news in the world. Sometimes it would seem the weather people have no idea of why things are happening and where we are headed, but once again we are plunging into another Arctic Vortex and it will have sweeping effects across the United States as we approach Christmas. I remember Fox Network in the midst of a power out and New York with airports closed, planes grounded, showing a clip of children making a snowman and saying aren't these children having a great time. Obviously, the world is becoming desensitized and this is because of a mainstream media which now creates the news rather than reporting it. NASA has films up showing the meliting of the polar ice caps. While some say we are not sure if there is global warming, most certainly something is melting them. Looks like I am pretty much winging it solo here on AFT as a nasty storm arrives here in the U.S. There is very little mainstream coverage and the updates on YouTube are sparse. The reality is that a few years ago they would be all over this but because of the election, it is being ignored. It is bad. Will it be as bad as several years ago. We do have a Polar Vortex. A "life-threatening cold" with record low temperatures of -34C could hit parts of America today. Conditions in parts of the US are expected to be so dangerous that forecasters have warned people risk frostbite after being outside for 10 minutes or less. The National Weather Service (NWS) said parts of northern US are at risk, particularly Montana and North Dakota. The NWS said people in North Dakota face "life threatening cold" and the risk of frostbite while in Montana dangerous wind chills are expected to last through this afternoon. We are getting the cold here in Oklahoma. Yesterday the high was 75 degrees (which is unseasonably warm) but right now its 34 with a wind chill of 22. Tonight it's supposed to drop to 9 degrees, with wind chills in the - and some ice and snow later today. We are used to ice, snow and cold, but not this cold. The Polar Vortex is hitting across the United States as has been predicted from November. It was near freezing her in Monterey, California where it is never that cold and although several stations are reassuring of a warm up - so far it's not happening. With all the talk of global warming, the oceans are getting colder. All this ice melting is effecting the climate and especially the Gulf Stream which warms both the United States and Europe. The Bray cycle appears to be closely tied to tight clusters of grand solar maxima and minima. The Little Ice Age Wolf, Spörer, Maunder and Dalton grand minima are the best example of a solar grand minima cluster and they fall in a Bray low. The Greek Dark Age and the Homer grand minimum also fall in a Bray low. Significant historical events that fall in Bray lows are labeled in figure 2. A more complete picture of these events can be found here. The Little Ice Age (LIA) is a well-known cold period filled with plagues and suffering due to cold, for more details see here and in Dr. Wolfgang Behringer’s excellent book. The period labelled “GDA” is the Greek Dark Ages, during this Bray low the Late Bronze Age ended and after a period of civilization collapse, the Early Iron Age started. The “Uruk” Bray low event corresponds with the expansion of the Uruk civilization and the growth of some of the world’s first cities. Near the end of the Uruk Bray low, the Middle East transitions from the Copper Age to the Early Bronze Age and cuneiform writing appears. You can read the full text of this interesting essay HERE. I also found the comments on this essay by Andy May and Javier very interest and worth your time to review. It is clear we have multiple solar cycles creating a complex mix of overlapping cycles, where the sum of the influence waxes and wains over time. We live in a complex universe. When is a polar vortex not a polar vortex? When most of the major news stations have changed their terminology to "Arctic Air". A few years ago - as I sit here with rain literally pouring for days - we would have been getting reports of flooding in Southern California - flood warnings out - and so forth. What happened on top of it mainstream and the weather? Those melting ice caps and diluting Gulf Stream is starting to really effect things. comment: Yes, last year or a ways back it wasn't politically incorrect to talk about global warming or a possible ice age coming. Perhaps it isn't the factories and humans causing the climate change - but we are seeing one. If the theories concerning the Jet stream and the currents prove true - we could be in for 30 years of really cold weather in the U.S.
Scientists say a large iceberg is poised to break off Antarctica, which could herald a wider break-up of the Larsen C ice shelf. A vast iceberg, expected to be one of the biggest ever recorded with an area slightly smaller than the city of Perth, is poised to break off Antarctica. A rift, slowly developing across the Larsen C ice shelf on the Antarctic Peninsula in recent years, expanded abruptly last month, growing by about 18km. It is now more than 80km long with just 20km left before it snaps, scientists said. "The Larsen C Ice shelf in Antarctica is primed to shed an area of more than 5000 square km following further substantial rift growth," scientists at Project Midas at the University of Swansea in Wales said in a statement. It would appear we are on the verge of the Ice Age I have been posting about. Some are saying the incredible period we are entering is due to polar axis shift i.e. Linda Howe who was in one of my books - a film producer and researcher. We have never rain like this in California since I was a child and it would literally pour rain for weeks. We are entering another storm which could bring yet another foot of rain to us with many floods. We are getting polar vortexes which are not even being called that and serious cold throughout the midwest. Are we about to have at least a mini-ice-age in the U.S. and Europe? Add to that a series of quakes and tectonic plate shifts. Experts believe the UK could be in for a big freeze within the next few years as three major forms of climate change trigger "substantial cooling”. Dramatic climate changes and "hasty policies" to handle them could mean "rolling blackouts" in the UK over the next few years. These "worse case scenario" climate would hit the elderly hardest, leaving "some pensioners alone in the dark" on a freezing nights resigned to a "lonely death". Scientists recently warned the sun's activity is at its lowest for 100 years and some have even drawn parallels with the period when the last mini ice age hit. a) it is undeniable from records collected worldwide that the earth is warming, not cooling. Each year is warmer than the last. b) the effect of warming of the earth is primarily higher rates of evaporation, and more moisture held in the atmosphere (warm air holds more moisture than cold air, which is why a bathroom is steamy during a shower). What goes up must come down, so the immediate impact of global warming is increased rainfall and storms. c) It is true that the sun is in a "solar minimum" spell, which has happened in the past - the Maunder Minimum period, which corresponds to the "little ice age" when the River Thames would freeze over! However, it does not appear that any cooling from the minimum is enough to counteract the warming from greenhouse gases. The Arctic region is warming more quickly than other parts of the globe, so the "polar vortex" circulation patterns are being disrupted, bringing severe winter weather to many regions not accustomed to snow, freezing rain etc. We are seeing that in spades this winter. The heavy rains in California are also a symptom of global warming, and while this may seem like good news in the drought period, it may have little effect on the long-term effects of the drought. Climate is very complicated, we are trying to project the behavior of a huge, complex planetary system. Generally, I think the scientists are correct in that our ongoing warming will predominate, although there are regional changes that confuse people. Climate is not weather, it is measure in decades to hundreds and thousands of years. what more needs to be said on this issue? If you put a kettle on the stove and put a drop of color into the water you will see the color move. The hotter the water gets, the faster the color moves. As the heat drives currents until the overall temperature is the same everywhere in the kettle. The same thing happens on the Earth's surface only on a much grander scale and over a longer period of time. The upshot of this is that some parts get MUCH hotter and some get temporarily colder but this is transient. Overall the trend is up. The climate scientists take an average of temperatures over all of the Earth's surface to judge how hot it is getting, not just a few local, EASILY EXPLAINABLE, anomalies. This was not bullsh't, FluMom, just the culmination of very complex science. For those who want to read the article it is here: http://www.breitbart.com/big-government/2017/06/13/delingpole-ship-of-fools-iii-global-warming-study-cancelled-because-of-unprecedented-ice/ but remember, a small cold-spot does not mean that the whole thing is colder. "first documented cases of widespread surface melting. "